on the rescue efforts over the past weeks. that might endanger these efforts. eld at the home of Rhoda L.
way to becoming great successes. program will run from 6-8 p.m.
B and P member Rhoda L.
derer, as they've been dubbed. [reception beginning at 6:46 p.m.
"6= *u i nc oevvi.su iv uir'Unrtrl ni i amna Hnnhv .lonuarv i'i r\r. Ethiopia are the lost tribe of Dan. sible for saving 20 Jewish lives. tion Rodeph Sholom on Dec. 20.
moment in history. It is as if we could have saved 10,000 Jews from Auschwitz. continue until 10,000 Ethiopian Jews are safely in Israel. committing $60,000,000 to be paid by March 31,1985. For each $6,000 one Jewish life will be saved. SAVE A LIFE SAVE LIVES! "IF ONE SAVES ONE SOUL OF ISRAEL, IT IS AS IF HE SAVED THE WHOLE WORLD." and is payable in full by March 31,1965. 1100.000 on that one day. So where do the dollars go? On Jan. 27 answer the call. Division's Lion ofJudah held a luncheon on Jan.
Gerda Klein is coming to Tampa. contributors of up to $99). appear elsewhere in this issue." is co-owner of "Just Desserts"
Debbie Gitomer is married to Dr.
son, Josh and a daughter, Shira. Subject to 15% service charge. Sea, with its own pool and secluded beach. top off the perfect Israeli vacation. W Laromme hotels (inEy) Up. Both Burke and Gitomer ftff *****?***"*! 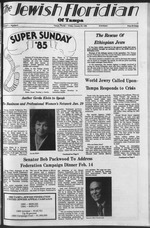 Jewish community organizations the 1985 Campaign Cabinet. Chapter, co-sponsored by the St.
this letter writing project in 1963.
must hold it high." he says. Fema Verbukh. Engelss St. 5. 4. spt. 82 Kishinev 27704. Ida Verbukh (sister of Fema). Sdirot Palatrin B. apt. 1. Hedera. apt. 52. Tula 300000. RSFSR. Nellie Yarkhin (wife of Yakov!. Str. Dolev 2-36. Carmiel 20100. Sasun Yusupov (son of Israel). Korn, poster winner; and Winkelman. Druzhby Naradov 11, kv. 46. Leib Tzuker, Plovdiva 9-3, apt. Leonid and Bella Doks. P.
discount on alt our other refuter fees. Financing is available on all dental services. VISA and Master Card v^lcome The actual let"
Cv-a> 9**CorBfcd Sua.8 IfUMI "0**1>*"
president of Women's Division Special Events. We., apt. 49, Riga 226000.
sure your letters get through. we hope to meet someday." Put on the correct postage. WE ARE NOW TALKING PASSOVER! Rodeph Sholom Jewish National Fund Shabbat, 10 a.m.
Jewish Towers Residents' Association Board Meeting, 10 a.m.
Professional Women's Network Event, 5:30 p.m.
dents' Association general meeting, 7:30 p.m.
meeting, 8'p.m. Rodeph Sholom Board meeting, 8 p.m.
itenischewitz hope it wiM make your holiday celebration more beautiful than ever. Honeyed Chk*en. Carrc4 Pudding, andBanana Nut Sponge Cake. Ml have a verv haoov and Kosher Passover! David Felman, chairman of the event. JeffAlper, Bill Wolfson, Nina Garzy, Rick Myers. Ceida Houseman, Cynthia Weiss, David Houseman. aled travel agencies in North America. 9-5:00 Sat. Bobby E. Bobo R.Ph. Harriet Pila, David Anton, Mitchell Linsky, Cynthia Weiss. Rick Goldberg, Natalie Goldberg, Esther Segall, Larry Segall. view on boulevard and park. Chris Cohen, Rob Cohen, Joyce Karpay, Barry Karpay. provided by an exceptionally qualified faculty. AN EDUCATION AT THE HILLEL SCHOOL OF TAMPA. NEW PANHANDLRS CLEAN AND SHINE . PANHANDCRS. THE M0 RUST DETERGENT PAD. tq mm wvaots snonwng pu>cn "
covf coxxntptWd mint M thorn"
Jason Harris Slohn. son of Mr.
of the Manhattan Beauty School. Soa Vacation Package In a . Announcing El Ala SunMtion Plue Vacation to Israel. ;**" un. v. iiabb. comparabl. eewaunodeUoa. II b.
to answer the call to life. "6Vi i lie iewit*|l f tr*Wllllrt OT I mmi / Wmnkv mt.tvv "
study group for 12 Jewish women"
Center on Wednesday, Feb. 20.
symbols such as the Star of! holiday desserts will be served. Two speakers will be featured. Sunday, March 10, at 7:30 p.m.
traditional fruits of "Tu Bishvat"
trees so as to prevent starvation. Chairman, will take place on Feb.
Hauben.Services: Friday, 8p.m. ; Saturday, 10a.m. Dally: Mlnyan,7:i.
Farber. Services: Friday.8 p.m.; Saturday. 9:80a.m. vices 7:80 p.m.-Sunday Bagel Brunches. 12 noon. to make a successful Seder. attend a weekly support group. call the center at 251-8437. Job Club, whkh meets even*! the women who come to tr"
flv now. An offer this good won't last forever. hotel, including breakfast and a Hertz Rent-A-Car for five davs. to the beautiful Red Sea resort of Eilat "
thru 1/5/85.) The deluxe Sonesta Hotel is also availablefor $144. methods of travel relate to us. doubles. Come join in the fun! with routines and special "inch"
walk-in. Give us a try! topic will be offered at 7:30 p.m.
Kaplan of the Hillel Foundation. $45 (a couple) for non-members. for our first movie of the series. held that afternoon at 1 p.m.
in the '80's" being offered on Feb.
and frolic, on Wednesday, Feb.
leave the Center at 8 a.m. sharp. extras to Judy London's office. Feb. 1 with Judy London. Q105 DJ, Mike Reeves for DANCING! fluence people. We have r"